Oh I would love to see some of those ideas! Wow, I take my chance! Those pamphlets look interesting. Thanks for the chance to win. I would love to win this, always looking for inspiration! I wish I would be the lucky one! I posted this on facebook too!!! 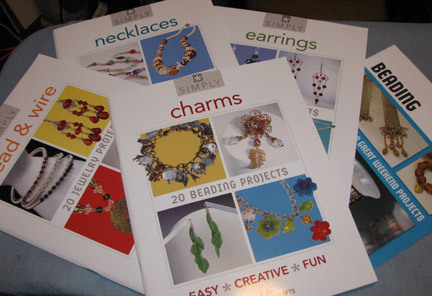 Just like there's never such a thing as too many beads, there's also never such a thing as too many books about jewelry making. This is great. I am not familiar with Contemporary Bead & Wire Jewelry, so I would love to win. Thanks for the opportunity. bride adorner at g mail dot com. Interesting combination of pamphlets. Would be fun to win them. Please include me in the drawing. Looks like fun! Always looking for more wire projects, FREE is even better!! LUV LUV LUV making wire jewelry!! Just posted giveaway to facebook! Please include us in your giveaway! I love bead and wire projects and books! Tweeted and Facebooked giveaway, too. What a fun pamphlet! I would love to learn some more wirework. just tweeted (and re-blogged) your posting. thanks for the chance to win! Thanks for the chance to win. Some great ideas there! I love wire and stone and I am always looking for new ideas and projects. Please enter me in your giveaway, thank you. What a sweet giveaway! Thanks:) can never have enough beading books - love to learn new techniques. Hope I win! hello! Just found you and will be looking/reading ! I am also interested in the wire book....have only made simple loops, and attaching (am fairly new to this) and bought wire because wire work looks wonderful! Your booklet would be a big help! Would love to improve my wirework by adding this to my library. I am in!! I would love to improve my wireworking technique.